Abstract: The geochemical characteristics as well as the LA-MC-ICP-MS U-Pb zircon age relationship between two granitoid suites found in the Goryczkowa crystalline core in the Western Tatra Mountains were studied. The petrological investigations indicate that both granitoid suites were emplaced at medium crustal level, in a VAG (volcanic arc granites) tectonic setting. However, these suites differ in source material melted and represent two different magmatic stages: suite 1 represents a high temperature, oxidized, pre-plate collision intrusion, emplaced at ca. 371 Ma while suite 2 is late orogenic/anatectic magma, which intruded at ca. 350 Ma. These data are consistent with a period of intensive magmatic activity in the Tatra Mountain crystalline basement. The emplacement of granitoids postdates the LP-HT regional meta- morphism/partial melting at ca. 387 Ma and at 433—410 Ma, imprinted in the inherited zircon cores. 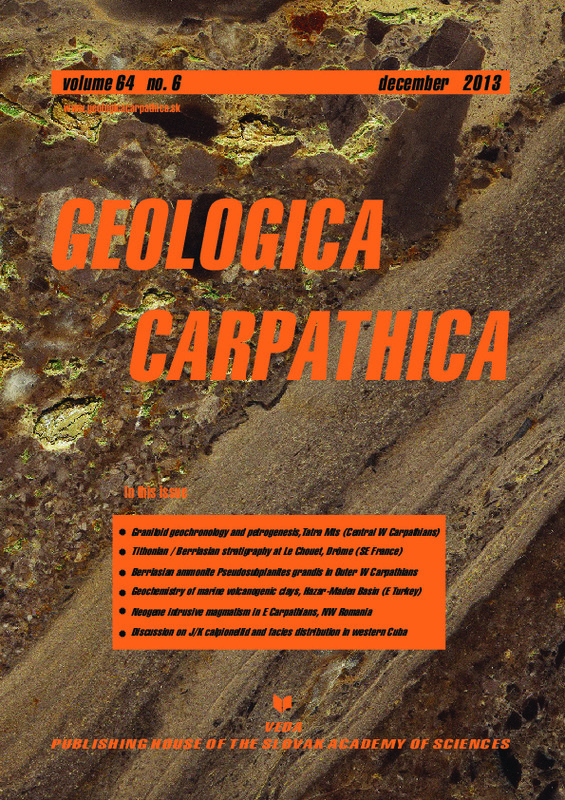 Abstract: This paper discusses the results of a study of the Le Chouet section, its lithologies, facies, magnetic proper- ties and fossil record (ammonites, calcareous nannofossils, calpionellids and calcareous dinoflagellates). Data obtained have been applied to give a precise biostratigraphy for this carbonate sequence as well as a paleoenvironmental recon- struction. Its relationship to magnetostratigraphy, based on a modern study of a French site, is important. Investigation of the micro- and macrofossils shows that the site comprises a sedimentary sequence in the Microcanthum to Jacobi ammonite Zones, and the Chitinoidella, Crassicollaria and Calpionella Zones. Several calpionellid and nannofossil bioevents have been recorded on the basis of the distribution of stratigraphically important planktonic organisms. The site allows us to calibrate the levels of various biomarkers and biozonal boundaries, and correlate them with the magnetozones M20n, M19r and M19n. Abstract: The first finding of the index ammonite Pseudosubplanites grandis (Mazenot, 1939) in the Lower Berriasian Štramberk Limestone (Outer Western Carpathians, northeastern Czech Republic) is important from the point of view of both the paleogeographical distribution of this species and of more precisely defining the upper boundary of the Štramberk Limestone (Early Berriasian Berriasella jacobi Zone) formerly regarded as Late Tithonian in age. From the taxonomi- cal point of view, new data on a non-deformed cross-section of the adult whorl and above all on the shape of the adult suture line of this species have been obtained. Abstract: The Hazar-Maden Basin sediments were deposited along the southern branch of the Neotethys Ocean margin during Late Maastrichtian–Middle Eocene times. X-ray powder diffraction (XRD), ICP-AES, ICP-MS and scanning electron microscopy (SEM) were performed on samples of the Upper Maastrichtian–Middle Eocene Hazar Group and the Middle Eocene Maden Complex from the Hazar-Maden Basin to investigate the main effects of depositional environmental parameters in three sections belonging to deeper marine (slope), proximal arc volcanic (Mastarhill and Yukarıbağ sections) and shallow platform marine (Sebken section) settings. Marine sediments contain clay minerals (smectite, smectite/chlorite, chlorite, illite, interstratified illite/smectite, illite/chlorite, palygorskite), clinoptilolite, quartz, feldspar, calcite, dolomite, opal-CT and hematite. The clays are dominated by iron-rich smectites. La, Zr and Th concentrations are high in the shallow marginal Sebken section where the terrestrial detrital contribution is significant, while Sc and Co are more dominant in the deeper marine (slope) Yukarıbağ section, which is represented by basic-type volcanism and a higher contribution of hydrothermal phases. In a chondrite-normalized REE diagram, the negative Eu anomaly in samples from Sebken, the section which was deposited in a shallow marine environment, is less significant than that of the other two sections indicating the presence of a high terrestrial contribution in that part of the basin. A decrease in LREEN/HREEN and LaN/YbN, LaN/SmN ratios from Sebken to Mastarhill and the Yukarıbağ sections indicates deepening of the basin and an increasing contribution of volcanism in that direction. Abstract: Earlier geological work in the Oa —Gutâi Mts (OG), Eastern Carpathians, has revealed the extensive pres- ence of shallow subvolcanic intrusive bodies, both exposed on the surface and covered by Paleogene-Neogene sedimen- tary sequences and Neogene volcanic formations. This study is based on detailed mapping and sampling of the OG Neogene intrusive magmatic rocks. Thirty seven representative intrusions (sills, dykes, microlaccoliths, etc.) were selected for radiometric dating. These intrusions show a wide variety of petrographic rock-types: from microgabbros to microgranodiorites and from basalts to andesites. However, the intrusions consist of typical calc-alkaline, medium-K rocks, similar to the volcanic rocks which outcrop in the same areas. The K-Ar age determinations on whole-rock samples of intrusions yielded ages between 11.9 Ma and 7.0 Ma (from Late Sarmatian to Middle Pannonian). The results are in good agreement with the common assumption, based on the biostratigraphic and geological data, that large volumes of intrusions have formed during the paroxysm of the intermediate volcanic activity in the OG. Except for the Firiza basalt intrusive complex of the Gutâi Mts (8.1—7.0 Ma), the OG intrusions show similar K-Ar ages as the intru- sions of the “Subvolcanic Zone” and Călimani Mts from Eastern Carpathians. The timing of the OG intrusive magmatism partially overlaps with the timing of the intrusive magmatic activity in the Eastern Moravia and Pieniny Mts. The systematic radiometric datings in the whole OG give clear evidence that the hydrothermal activity related to the epithermal systems always postdates intrusion emplacement.